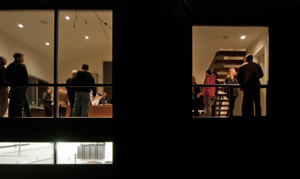 It seems like only a short while ago that the BUILD Case Study House was just an idea we were mulling around the office. We had identified a close-by parcel of land in Seattle that represented many of the new circumstances of building in the city: it’s dilapidated existing home was positioned on a steep slope, above a secluded watershed, and it employed some land use agreements including access easements. More and more, these types of lots, with design challenges, are the only buildable lots left in cities, but previous potential buyers rejected the property because they couldn’t see the possibilities beyond these variables or come to grip with the cost and complexity of building there . So there it sat, with a tumble down structure, on a beautifully wooded site, within a cherished Seattle community. At the same time, it presented the perfect opportunity for a design-build firm that could assess the variables and find solutions – a calculated opportunity for us, but a risky and costly exercise for someone outside of our industry. The further into the study we got, the more important the project became. The solutions we were finding to solve the site and environmental complexities could be applied more broadly to similar situations around the city. The design was starting to take the shape of something that could cater to a wide, multigenerational, demographic, be they creative professionals needing additional studio or shop space, or really anyone who wanted a custom home in a serene, wooded setting just moments from Seattle amenities. 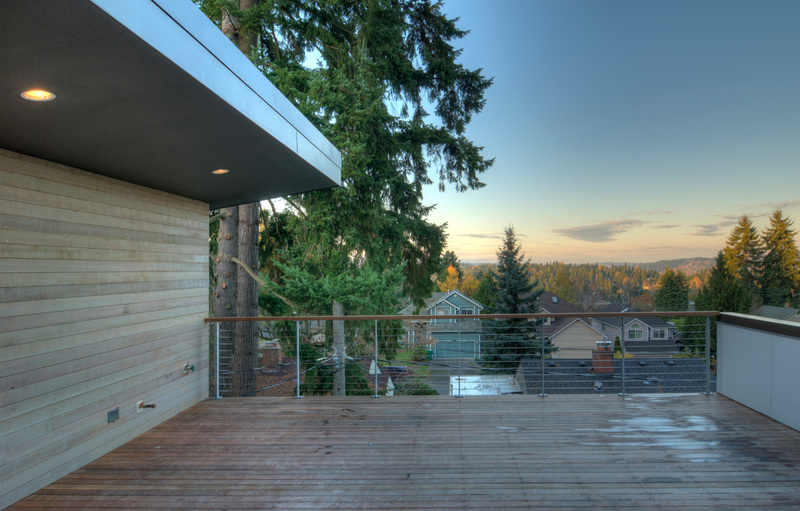 Although we took care to stretch our design goals and optimize the site opportunities, we did so with an eye toward construction methods that remained within the bounds of custom home convention. And through a disciplined process of design and budgeting, the costs were, in terms of new modern home construction, reachable. By the time we had building permit in hand, the project had become something more significant than just a single family house on a complex site. 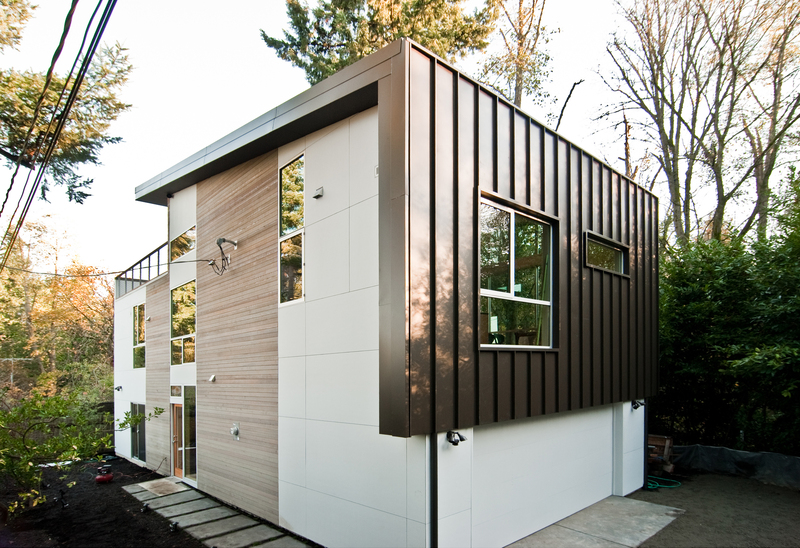 Rather, it became a Case Study of design, permitting, costing and construction; it established solutions to apply across the board; and although making custom homes in Seattle will trend toward becoming more complicated over time, this project showed that we created a successful formula that could be repeated. The process and journey has been a rewarding, learning experience for us, and we appreciate all of you who’ve been keeping up on the progress posts and photos along the way. Now that we’re over a month into its completion and occupation, we’re ready to share a bit more on the backstory, timeline and construction costs. We’re going to lay bare what so many others protect, consistent with our primary intent of the transparent BUILDblog. Approximately one month was spent navigating the challenges constraints specific to this site – discovering the variety of setbacks, defining all critical areas including Thornton Creek which can be heard meandering below the house site, and the related buffers to resolve the requisite land use issues. Meeting with the Department of Planning and Development at this early stage was enormously helpful in determining, and confirming, all of the regulatory hurdles that we’d be facing. Through all our research, the footprint ‘revealed’ itself, and the fact that it allowed for a relatively conventional foundation was good news. It meant we had a viable project on our hands. The programmatic goals for the house were to design for a family of four, including a potential, and able to be separated, mother-in-law unit with private outdoor space for an aging adult on the main level. It would also include a flexible shop/ creative space with heated concrete floors connected to the entry corridor, as well as other spaces to accommodate working from home. The second level would really push an open and airy plan throughout and provide the main living area. 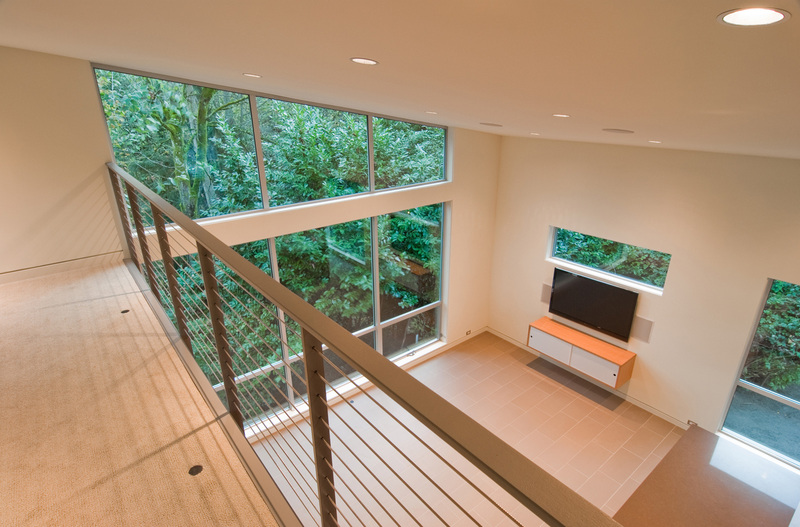 As part of this airy second floor, accessed from a stair, is a casual loft area that could be used for a media area or reading space as well as an elevated outdoor terrace for dining and lounging to take advantage of classic views of Pacific Northwest mountains. 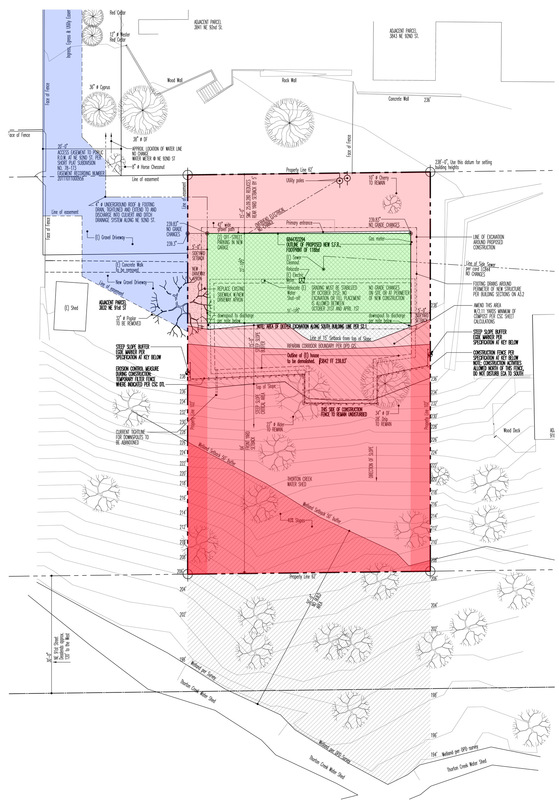 Although our site has a generous and wooded area of over 6000sf, our program was optimally confined to a relatively buildable area closer to 1200sf. We spent a considerable amount of time tinkering with the design to strike the right balance among a variety of design dependencies. Operating both as client and designer (as anyone who’s been in this position can attest) is both a blessing and a curse. At times we could be our own worst client potentially overthinking things, but the experience offered us an honest glimpse into the client side of a project. With each new venture into personal projects, we can empathize with, and appreciate much more, the trust and patience required of each of our clients. As rigorous as we were in exploring all the possible options, we felt the struggle of moving through the design process and transitioning into the next stages as the project progressed, revisiting issues we thought we’d resolved just to make sure. With any endeavor as big as building a modern home with all the intrinsic complexity and elegance in process and in the final outcome, these thoughts and emotions are only all just part of the process. Yep, you read that correctly: 6 months. After jumping through all the expected hoops, signing all the necessary paperwork, codes met, easements defined, we thought we were in the home-stretch, poised for groundbreak. Then, a curveball came our way: Stormwater drainage. Beware of this beast. The intuitive and sensible route would be to drain down into the Thornton Creek Watershed located at the bottom of the ravine, which slopes southward on the property. This drainage plan made sense to us, to our well-respected geotech (soils engineer), and even the DPD (building department). It was an environmentally sensible strategy to collect stormwater from the site, tightline it down the slope and distribute it back into the creek. Besides being sensible, this pathway also struck us as the most appealing and environmentally sensitive solution since it minimized disturbance of the access road (and the large cedar trees that line our access road). Ah well, with some additional care and extra energy, the environmental and tree concerns can be mitigated nonetheless. We didn’t realize the issue was not about sensibility, but about arcane rules (see: lack of agreements) between various agencies that needed to be enforced. Since our water had to cross other City of Seattle land before it hit the creek, the sensible option became an impossible one. With the help of advocates at the DPD, we were guided towards an alternate solution that worked. But as these things go, this consumed a significant amount of time (months, in fact, to the permitting phase alone) and money (thousands of extra permitting dollars). One of the options that we didn’t pursue was site retention – the creation of a large rock well on the property to hold and slowly release stormwater. We nixed the idea due given our wooded slope location and undesirable aesthetic and functional impacts on the property. Also, adding stormwater to the sanitary sewer system was a no-go (though we pushed, and hard). In the end, the irony of it all still gets us: All that time, money, and wheel-spinning just to install a stormwater collection system to direct stormwater from the site 150′ in the opposite direction of the ravine via a private easement into an open culvert at the street, and there it would begin its circuitous journey through maintained drainage areas to finally arrive at–wait for it–the Thornton Creek Ravine! 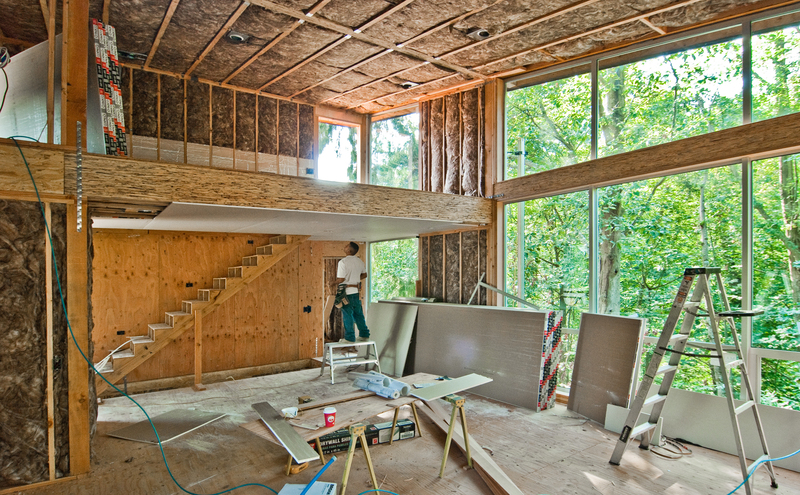 We are left shaking our heads, but ultimately, we have a durable system that complements a home built to last 100 years. It wasn’t the straightforward solution we envisioned, but it remains consistent with the goals of the project. And not being ones to squander the extra time added to the project, we worked through construction financing while the drainage permitting was in process. Demolition was a quick and easy deal. It helped that we weren’t reusing any portion of the existing structure, and the existing structure was partially demolished by its natural surroundings anyways. 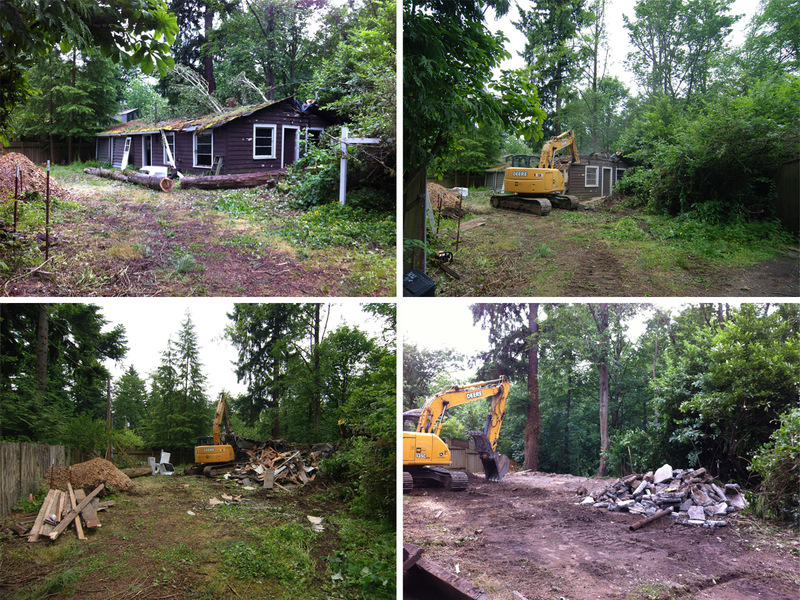 We covered the ins and outs of these two weeks in our original blog post on CSH demo/excavation. Though we mentioned the challenges of being your own client in the design phase, during the construction phase, however, being your own client has a huge payoff. We were able to short-circuit many processes and roll through decisions on the spot. Many of the decisions could be made right there on site, design clarifications could be penciled out on 2x4s rather than going back to the office and generating AutoCAD drawings, PDFs and emails. There was no halt in momentum. It also didn’t hurt that the new house was a relatively simple geometry. And we were game for taking a few calculated risks (like ordering windows way early to reduce time factors) since we knew we could make adjustments later if we made mistakes. Luckily, we didn’t make many mistakes and completed our Case Study in about half the time of a similar type of custom home. It is also helpful that our industry is still relatively slow as we look to emerge from the recession. We have our various trades full attention, and are not only able to keep our timeline tight, but able to take the extra effort to ensure each phase is completed correctly. While a faster-paced time in the building industry reduces quality, a slower building industry, like where we find ourselves in 2012, helps ensure it. Plus, our trades appreciated the opportunity the project provided as much as us, and their pride was evident through construction. A similar project, without property, would cost approximately $660K. 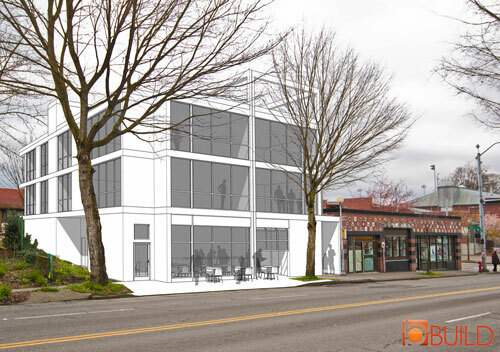 Our project at the market-rate, taking into account every single cost (including property), would come to $805K. Not factored into the numbers above is the significant hours of work that we self-performed on the Case Study House. Being the scrappy and resourceful operation that we are, we used everything we could (equity, elbow grease, sheer will, working nights/ evenings, and calling in favors). At the same time, it’s important for us to communicate market rates for this project so that the study can be an apples-to-apples comparison and realistically relate to a variety of applications. 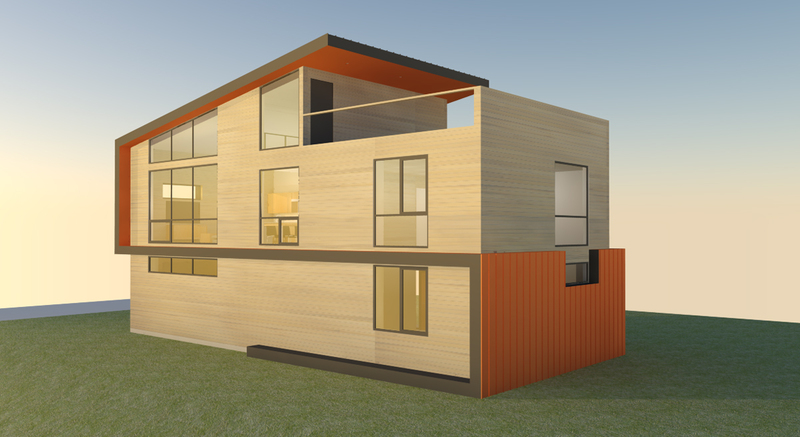 The BUILD Case Study House allowed us to take everything we’ve learned so far about design, permitting, budgeting, construction, and development, and accurately apply it to crafting a home in today’s complex environment. Because the project documents the entire process from initial land feasibility to the landscaping around a completed home, the study is a wealth of realistic information. To us, the real genius of the original Case Study House* program was its capacity to share professional knowledge with society at large. And if a rising tide raises all boats, this project has been an important opportunity for us to share our own findings and solutions with the design-minded of today’s world. We hope that, in some way, this information forwards design in our communities and cities. * We anticipate there will be comparisons and criticisms of this project with the original Case Study House program conducted from 1945 to 1966 by Arts & Architecture magazine. While the BUILD CSH is a design-forward response to the modern lifestyle, it is also poised as a response to the complexity of the remaining sites in our cities, the difficulties of obtaining permits, and the rising costs of construction. Great work! I enjoyed following you along in this build and look forward to more. I am constantly amazed at the amount (and quality) of information you all are willing to give away on this blog. I’ve enjoyed following along on the case study house journey -thanks for the in-depth data along the way. I’d wish you luck on the next venture, but I don’t think you’ll need it. Is the house going to be sold? Awesome to see the conclusion to your journey! What a wild ride and clear view into the meddling of our various levels of government. It’s truly astounding that anything ever gets done in our fair city. Kudos guys. I also am amazed by the quality and quantity of information that you share on your blog, thanks. As a design/build person who used to be an architectural firm serf, i especially appreciate your willingness to demystify the whole process involved in the profession. For years, architects have zealously guarded information as if it were a gold mine accessible only to the few amongst us ‘smart’ or ‘artsy’ enough to comprehend it. Thanks for doing good whilst doing good work. Will echo other comments-the appreciation of the disclosures on cost, obstacles, etc. Question: $8K on bank fees/appraisal? Please explain. What a cool project, and what a great resource of common sense. I love the spirit of your thorough blog. It is very much in the best tradition of modern design. Rather than protect and exclude, you share information, improve the discourse and help foster knowledge. Thanks for all your unselfishly shared information. Great post, but I am surprised that the building code allows guards with horizontal wire (I guess) like in the last pic. That would allow a child to easily climb up onto the top of the rail and fall over. I’m in Toronto, Ontario, Canada and our Ontario Building Code only allows vertical openings in guards that would not allow a ball 4″ (or 100cm) in diameter to pass through it. This is so that children would find it very difficult to climb on top of the guard rail and fall over or to slip through the guard. However, I seem to see these horizontal openings in a lot of US homes. Very unsafe. 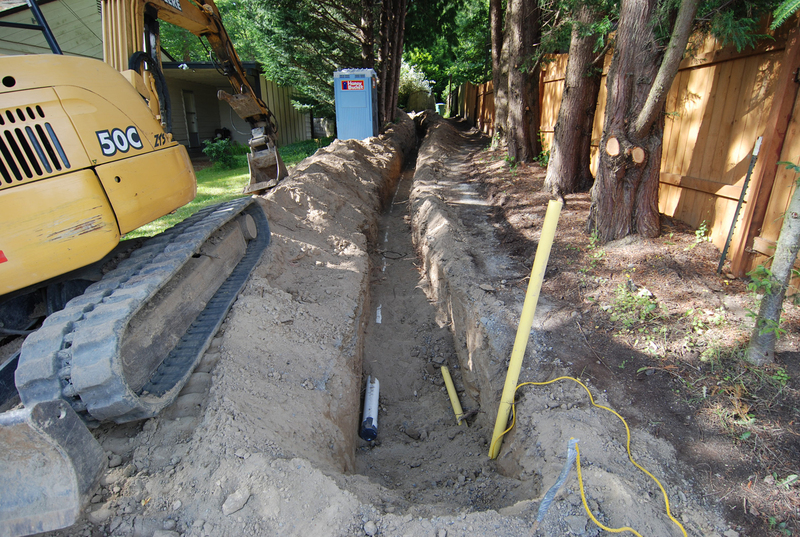 @ Noel – so far the International Residential Code allows horizontal rails in most of the jurisdictions we work with around the Pacific Northwest – it’s rumored to be changing in the future though. @ Zane -Yes, the construction management fees are in the construction budget. Our typical CM fee is between 10-12% of the construction budget.